The Nelson Chamisa-led MDC has re-assured under-fire vice president Elias Mudzuri that his position is secure even after being booed off stage by opposition supporters at a Harare rally on Thursday. Mudzuri was forced to abort his address, as tempers flared over his recent meeting with President Emmerson Mnangagwa at the president’s offices on Monday. Mudzuri was booed by the bumper crowd after MDC national organising secretary Amos Chibaya had sought to have him greet the supporters before Chamisa’s arrival. In the end, and very ominously for him, he failed to even chant the party’s slogans, as his voice was drowned out by the heckling from the rowdy crowd — which broke into a derogatory song “tengesa uone mashura” (just sell out and see what will happen). As a result, the emotional Mudzuri had to leave the venue altogether. MDC spokesperson Jacob Mafume said Mudzuri is still the vice president of the party and his position will not be determined by emotions.“At rallies emotions go up and down. The party leadership is looking on what happened to ... Mudzuri. He is still the vice president of the party and his position is not determined by emotions,” Mafume said. Efforts by the Daily News to speak to Mudzuri yesterday morning were futile. “Ndichakarara. I cannot comment,” was all Mudzuri said. 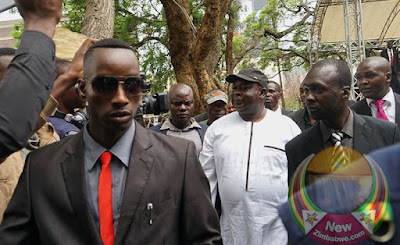 Mudzuri angered MDC officials and party supporters after he attended a meeting of Parliament leaders with Mnangagwa at his State House offices on Monday. He attended the meeting in his capacity as the leader of the opposition in the Senate. However, his colleagues in the National Assembly and Senate snubbed the meeting. However recently, reacting to the confrontation, Mudzuri told the Daily News he felt he had been treated disrespectfully.